The latest Digital Entrepreneur Leadership Forum took place in HK Cyberport on February 1, 2018. This time, the gathering of ambitious entrepreneurs focused on Artificial Intelligence and the business transformation related to this new technology. Policy makers, such as the Hon. Nicholas W Yang, Secretary of Innovation and Technology, met high-profile speakers from well-established companies and Cyberport entrepreneurs. AI is changing traditional industries and innovative computer firms alike. This powerful technology will disrupt business models and skyrocket innovative solutions in the near future. As part of the digital age, AI together with other technologies will lead to the biggest change in economy and society since the industrial revolution. The speakers talked about AI technology, the future opportunities and the change related to that. 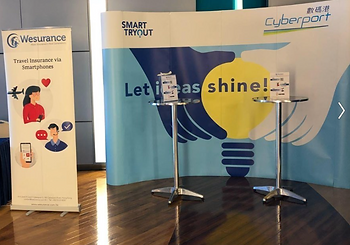 At the same day, Cyberport SmartSpace Smart Tryouts gave Wesurance a stage to present the App and promote the products. Especially Wesurance’s personal assistant ms.AMY impressed with her AI-chatbot for claim applications. A lot of participants showed interest and downloaded our app.Thanks for passing by and see you next time.